Pharmaceutical cannabinoids such as nabiximols, nabilone and dronabinol, and plant-based cannabinoids have been investigated for their therapeutic potential in treating multiple sclerosis (MS) symptoms. 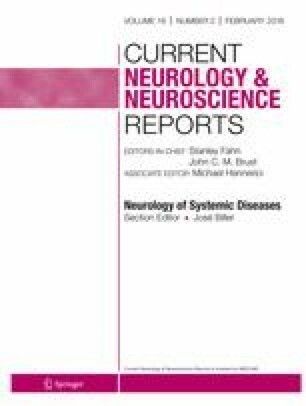 This review of reviews aimed to synthesise findings from high quality systematic reviews that examined the safety and effectiveness of cannabinoids in multiple sclerosis. We examined the outcomes of disability and disability progression, pain, spasticity, bladder function, tremor/ataxia, quality of life and adverse effects. We identified 11 eligible systematic reviews providing data from 32 studies, including 10 moderate to high quality RCTs. Five reviews concluded that there was sufficient evidence that cannabinoids may be effective for symptoms of pain and/or spasticity in MS. Few reviews reported conclusions for other symptoms. Recent high quality reviews find cannabinoids may have modest effects in MS for pain or spasticity. Future research should include studies with non-cannabinoid comparators; this is an important gap in the evidence. The online version of this article ( https://doi.org/10.1007/s11910-018-0814-x) contains supplementary material, which is available to authorized users. The editors would like to thank Dr. John Brust and Dr. José Biller for taking the time to review this manuscript. Funding was received from the Commonwealth Department of Health and the NSW Government Centre for Medicinal Cannabis Research and Innovation, who determined the topics and scope of the reviews to be conducted and funded the salary of MW. SN and LD are supported by NHMRC research fellowships (no. 1132423 and no. 1041472). The National Drug and Alcohol Research Centre at the University of New South Wales is supported by a funding from the Australian Government under the Substance Misuse Prevention and Service Improvements Grant Fund. SN, MF and LD have all been investigators on untied investigator-driven educational grants funded by Reckitt Benckiser. MF and LD have received untied educational grant from Mundipharma for post-marketing surveillance studies of new opioid medications. SN, MF and LD have been investigators on untied investigator-driven educational grants funded by Indivior and Reckitt-Benckiser. NB is a member of the medical cannabis expert panel for New South Wales Health. WH provided evidence to parliamentary committees on medical uses of cannabis in Australia and the United Kingdom and is a member of the Australian Advisory Council on Medical Uses of Cannabis. SN, WH, MF, MW and LD have previously published manuscripts on the topic of therapeutic use of cannabis. Other authors declare no conflicts of interest.